All humans have a brain, many people know how to use it and only a few know how to use it effectively without going over the limits of harmony created by the Universe. We also have our heart and even though it may seem that it is an organ that is much easier to use, human feelings and emotions have to go through a challenging refinement process for us to perceive what is really happening. It has been a corner stone for many arguments between scientists and spiritual teachers. 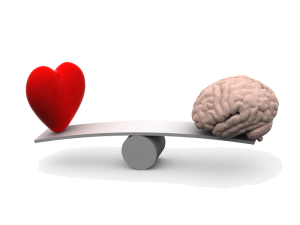 What is more important – intellect or emotions, rationality or feelings? Our logic acts as a filter for information and our feelings are often very hard to interpret and understand. It seems that both of them can’t really exist together in the same room, much like fire and water. Too much water would put the fire down and too much fire would vaporize water. However, if you really know how to use both, you can create something similar to a steam engine, where both fire and water are used to create power. 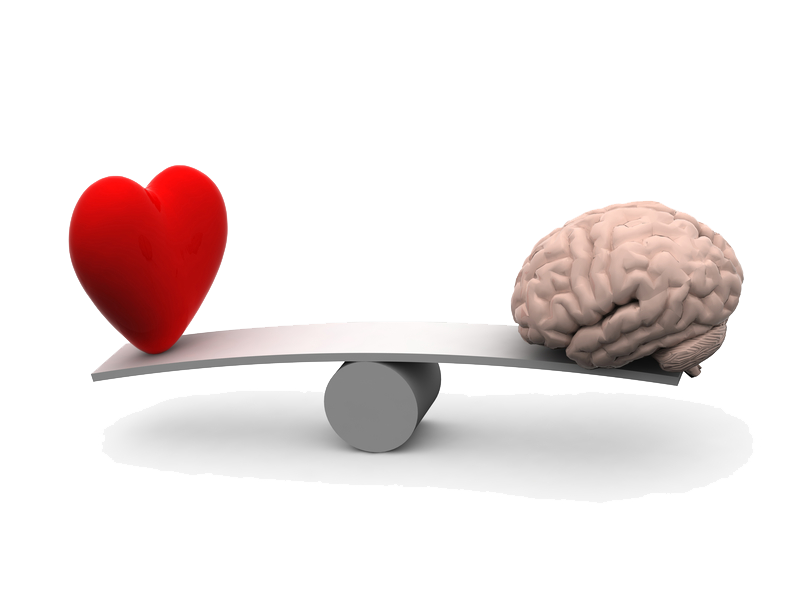 Most scientists would probably argue that the human brain is more important than the heart. After all, they can give a quite logical explanation of why it is true. First of all, the human brain seems to be much more complicated than the human heart. Some claim that we use only 10% of our cerebral brain capacity (films like “Lucy” and “Limitless” are great examples of what happens if you tap into more than those few %). Perhaps at this moment of our evolution, we can only give an explanation (or give scientific model) to mere ten percent of human brain work. Even with all the modern equipment and devices, there is still a lot of mystery as to how the brain really works. 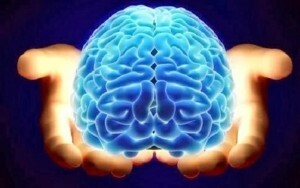 Thanks to our brain we can communicate with the world, we can perceive and transmit information. Because of our brain we know how our skin feels when we touch something, we know how the birds sing when they do, we know how a rose smells, we know how an apple tastes, we know sunrise, sunset and then again sunrise when we see it. We need the brain to express our thoughts in words and move different parts of our body. We really do take for granted a lot of things that human brain can do. The human heart, on the other hand, seems to have only one major function in our body – to pump blood. Yet, it is an amazing organ that works as long as we live. If we are involved in complicated brain work, our heart sends extra blood to the areas of the brain that need more power. If human brain shuts down our heart can only beat for few seconds and if our heart stops, then supposedly we have up to 5 minutes to turn it back on. Many people use this fact as a proof that human brain is more important than a human heart. However, the heart is what makes us feel and be human. Through our heart, we can interact with the world on the emotional level. Thanks to our heart we can be compassionate, we can express kindness and care for something other than our own survival. 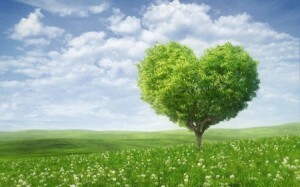 More importantly because of our heart, we can feel Love. Many people on their spiritual path believe that Love is the only true way to the “enlightenment” and that brain should always listen to the heart, but that is just tilting the vessel to one side and making it go in circles without noticing the need for a balance in order to go forward on a spiral of spiritual growth and evolution. There is really no sense in claiming that one is more important than the other. A more effective way will be finding a model that can explain the work of both without giving more importance to one or the other. The following model (based on the new scientific field of Infosomatics and the research of the International Institute of Social Ecology) gives an easy to understand explanation on how things really work. The beauty of this theory is that it does not contradict existing scientific or esoteric models. It actually expands them and takes us to the higher level of understanding. To understand this model we just have to see a human body in a form of electro-magnetic waves where the human brain is a complicated radar system that can perceive information and transform it into energy, while human heart is a “power generator” that creates an environment for the needed information to be transformed. The human brain has zones that are responsible for certain functions of your body. When your brain receives waves of information from the surrounding environment (flat parallel cosmic rays), it transforms them into energy and sends it all over your body through biologically active points (the existence of these points has been proven by several scientists and they have been used in practice in Chinese medicine for the last 4000 years). This energy is what forms energy centers (chakras in esoteric literature) that are responsible for certain organs and systems of human body. 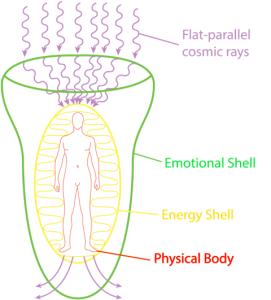 The work of these energy centers is what forms human energy shell (human aura). 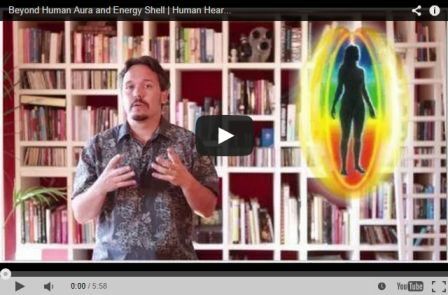 Your heart (together with the energy center that is responsible for its work) creates another shell (emotional shell) above your human aura (see the picture). 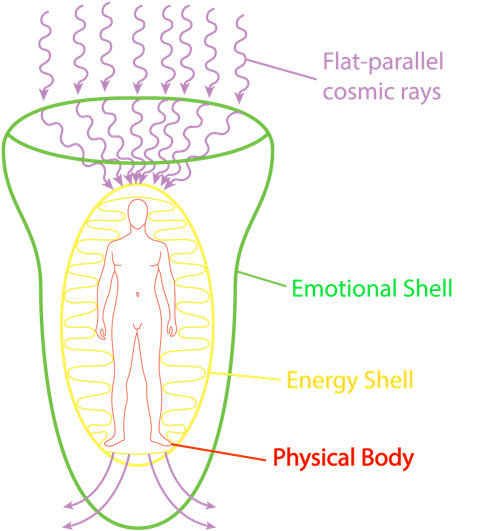 The emotional shell is responsible for the amount of flat parallel cosmic rays that your brain can receive. It’s like a magnifying lens that concentrates the rays on the top of your head (crown chakra in esoteric teachings) so your brain can process them. Emotional shell is powered by your emotions. The more positive emotions you experience in life, the bigger your emotional shell is. When you have a big emotional shell (it happens when you are true to yourself and positive towards things that happen in your life) your physical body gets sick a lot less. Big emotional shell ensures a larger number of rays that your brain can receive and transform into energy. This process makes your energy shell much more stable to external harmful influences on the energy level. Your energy shell is just like an atmosphere of the planet that protects it from meteor showers and asteroids that can harm it. This model is also supported by the latest scientific research which claims that people who see the world in negative colors get sick more often than those who have a positive look on life. This model gives a great explanation of how mutual work of human brain and heart create your life. 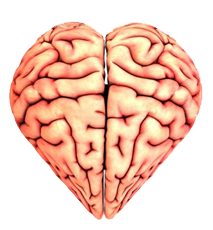 There is really no need to claim that human heart is more important than the human brain or the other way around. Their work is significant and vital for you to interact with the surrounding environment and enjoy life to its fullest. Excellent, well written, & enlightening. Thank you🤗. Many blessings🙏.